A glimpse into a year of taking The Ghost Trap and Maine Buggin on the road in Maine. Yeah, I'd do it all over again. Local resident Kay Stephens is the author of the award-winning novel, The Ghost Trap, (2009, Leapfrog Press) following the haunting story of Jamie Eugley, a young lobsterman struggling with the grinding responsibilities of a head-injured fiancée and mounting trap wars. 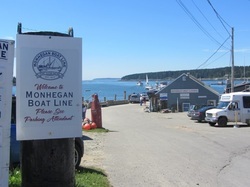 Stephens will be on hand at the Sea Star Shop, located at the Monhegan Boat Line dock Saturday May 24th at 9 a.m. to do a book reading/short presentation about Maine's lobstering subculture. She will splice fictional excerpts of The Ghost Trap with short documentary-style video clips of the lobstering DVD Maine Buggin, which gives the inside scoop on how lobster traps work, how they’re caught and how invisible territory lines are drawn. This is a fast, exciting presentation for those interested in the hard-working, intense lifestyle that goes with Maine lobster fishing. Between Fact and Fiction: The Subculture of Maine Lobstermen . K. Stephens, a Midcoast author of The Ghost Trap will host a presentation/fiction reading about Maine's lobstermen on (date) and (time). The Ghost Trap (Leapfrog Press, 2009) follows the haunting story of Jamie Eugley, a young lobsterman struggling with the grinding responsibilities of a head-injured fiancée and mounting trap wars in a fictional setting based around Tenants Harbor, Spruce Head, Port Cyde and Friendship. Stephens will splice fictional excerpts of The Ghost Trap with the documentary-style video clips of 4th generation Maine lobsterman Ryan Post's educational DVD Maine Buggin, which gives the inside scoop on how lobster traps work, how they’re caught and how invisible territory lines are drawn. This will be a fast, exciting presentation for those interested in the hard-working, fascinating lifestyle that goes with Maine lobster fishing. Books will also be available for purchase and signing. On Saturday December 3, 2011, Bayview Lobster Restaurant will host a book signing for three local novelists with a lobster theme between 3-5 pm in their lounge. K. Stephens, the award-winning author of The Ghost Trap (Leapfrog Press, 2009) has personal ties to Bayview Lobster, having featured the old lobster shack before its renovation in one scene of her novel. The novel follows the haunting story of Jamie Eugley, a young lobsterman struggling with the grinding responsibilities of a head-injured fiancée and mounting trap wars in a fictional setting based around Tenants Harbor, Spruce Head, Port Cyde and Friendship. Jim Nichols’ most recent book, Hull Creek (Down East Books, 2011), also depicts the modern lobstering life in the Midcoast. Hull Creek is a realistic and thought-provoking depiction of the struggles and temptations that confront lobstermen. True to character, dialogue and circumstance, this book continues to stand out among Maine fiction titles. Steven Powell’s first novel, Patch Scratching, (Maine Authors Publishing 2011) appeals to readers from 11 to 91. A coming-of-age story set in a Maine lobstering community, the novel follows a boy, Jed, who was abandoned by his mother. Powell's book looks at the meaning of family, the challenges of individuals who have been abandoned, work ethics and small-town dynamics. 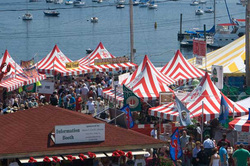 Join the “Christmas By The Sea” festivities Bayview Lobster has to offer. Come enjoy a hot cider or one of their local microbrews on tap and meet the authors personally. This summer I'll be adding a few presentations around The Lobster Festival in August...and possibly more in September, titled: “Between Fact and Fiction: The Subculture of Maine Lobstermen.” Even though Maine lobsterman Ryan Post will be busy working on a film project this summer, I'll be doing solo presentations, splicing fictional excerpts of The Ghost Trap with the documentary-style video clips of his educational DVD Maine Buggin, which gives the inside scoop on how lobster traps work, how they’re caught and how invisible territory lines are drawn. This will be a fast, exciting presentation for those interested in the hard-working, high drama lifestyle that goes with Maine lobster fishing. I'm indebted to Lori Hettler, who not only posted a thoughtful review of The Ghost Trap on her "The Next Best Book" blog, but has also arranged a giveaway contest for the novel in preparation for an April Author Chat on Goodreads.com So drop in throughout the month of April if you've read the book, want to read it or want to ask me any questions. I've also got a couple of Maine lobstermen on deck in case you want to ask them questions--so you can get the facts behind the fiction. Even if you've missed out on the Goodreads giveaway, I am offering a free signed copy of The Ghost Trap for those who enter a drawing for "liking" The Ghost Trap's fan page. A random number will be chosen at the end of April. I look forward to chatting with you! Lori Hettler is the creator and moderator of The Next Best Book Club (TNBBC) on Goodreads.com. It's the largest, most active book group on the site - boasting an astounding 7500+ members at the moment. Running this book group inspired me to create the literary blog TNBBC's The Next Best Book Blog , where my main focus is on indie authors and indie publishers. 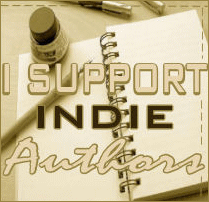 She reviews novels, interviews authors, spotlights publishers, and offers giveaways. Well, September 2010 wraps up an entire year of the book tour and I want to thank every book store, library, book club, and radio/TV location that hosted and featured us this year. It's been a good haul as they say. Ryan and I may be up for appearing a few more places in the spring so please contact me if you are interested in having us speak. Remember to shop local and keep Maine Buggin and The Ghost Trap on your radar. 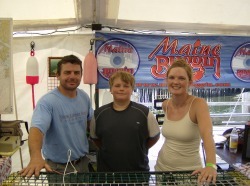 Maine is our home so we kicked off this book tour in Rockland "Lobster Capital of the World" in August, 2009. Accompanying me is 4th generation Maine lobsterman, Ryan Post, creator of educational DVD, Maine Buggin (www.mainebuggin.com), who’ll give the inside scoop on how lobster traps work, how invisible territory lines are drawn, and why trap wars usually happen outside of the news. Working together in a way audiences have never seen before, we are splicing fictional excerpts with true tales on the water--staging a fast, exciting presentation for those interested in the hard-working, lifestyle that goes with Maine lobster fishing.